Media startups are a lot like any other startup, in the sense that they are a risky bet on an idea or vision — but what makes them even harder is that they are aimed at an industry that is undergoing unprecedented upheaval, filled with potential customers who are struggling to keep their heads above water. What does success look like in that kind of environment? The Knight Foundation knows better than most, since it has funded dozens of startup ventures over the years through its News Challenge, and it has come out with a report that looks at what it has learned. The report considered the progress of 28 projects that applied for and won funding as part of the 2010-2011 Knight News Challenge competitions, and includes a profile of each — from the Front Porch Forum, a Vermont-based community-building service that started up in the aftermath of Hurricane Irene, to a winner called FrontlineSMS, which uses mobile technology to serve the information needs of small communities that don’t have reliable internet access. Selling innovations to news organizations is extremely difficult because they may lack the money and time to spend on innovative projects or the technical capacity to take full advantage of new tools. The innovation may also be entering a market guarded by institutions that may be resistant to change. Fundamentally, unless an innovation addresses a pressing need, journalists and news organizations will not adopt it. 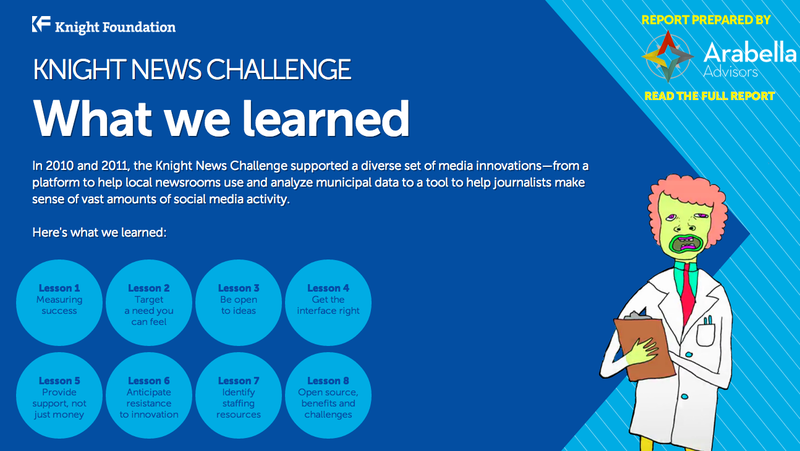 To take just one example, the report describes a 2011 winner called Zeega, which intended to build an easy-to-use platform for making multimedia stories out of video clips, audio clips and images. The team behind the project even supplied consulting services to newsrooms to help them figure out how to use it — but this drained their resources, the Knight report says, and made it difficult for them to continue developing the product, so they pivoted to focus on the consumer market. In other cases, a real need for a new tool might exist, but the barriers to its adoption might simply outweigh that need… ScraperWiki, for example, a 2011 News Challenge winner, received funding to adapt its tool to help journalists collect, store and publish data from across the Internet. But the project team found that news organizations were either unwilling to pay for the tool or that the learning curve was too steep. In that kind of environment, it’s important to prepare for resistance to an idea and plan ways around it, the Knight Foundation says: a project called OpenCourt that won funding in 2010 wanted to live-stream court proceedings and trials in Massachusetts, but ran into a significant roadblock in the form of lawsuits aimed at preventing it from doing so. The company appealed to the state’s Supreme Court, however, and ultimately won a decision that said OpenCourt was entitled to install cameras and stream court proceedings.